Neil instructs in the Stand Up Paddling (SUP) program. Neil is still working on expanding his 30+ year career in the parks, outdoor recreation and tourism fields, much of which has been spent as a professional whitewater rafting, canoeing, ocean kayaking and now, stand up paddling instructor and guide. 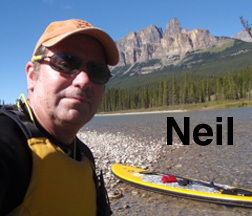 In addition to to his paddling certifications, Neil holds a Masters Degree in Environmental Design from the University of Calgary and has spent many years working in environmental science and impact assessment. Neil keeps coming back to his real passion though – getting people out on the water and into our wild places! Stand up paddling is just simply one of the easiest, versatile and most fun ways to get out on the water and Neil would love to help you get started!